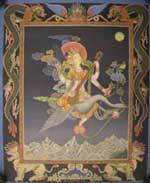 Sarasvati is the Hindu goddess of learning, the bestower of wisdom. As such she is also the goddess of science, of literature and music, of fine art more generally. She is spoken of as "intellectual", as a "protectress of intellectuals". She is also venerated by Buddhists and Jains. I don't know how one might reconcile the idea of a goddess with rationality and science, with intellectuality. I won't try. 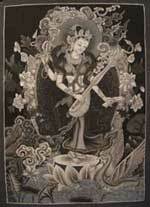 But as Sarasvati covers just about everything this website stands for, I'm going to encourage her to stick around. 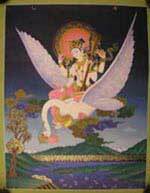 Sarasvati started her career as a river goddess, in the Vedas. The word means "the watery". Indeed she was the Sarasvati River, which is in Gujerat, India. It flows from the northern borders of that state south-west into the Little Rann desert, where it becomes mysteriously lost in the sands. A scientific study of the ancient river beds shows it used to be the confluence of other rivers, and flowed to the ocean. Later in the Brahmanas, and the Mahabharata, Sarasvati became identified with Vac (Vach, Vak meaning word), the goddess of speech, of eloquence. Perhaps it was something about that mysterious sibilant quality of water; if you've ever been in a cave or grotto where water is running somewhere you'll know what I mean. This idea plays an important role in my novel The Expedition - in Part I, but more importantly in Part II, Chapter 9, which deals with the origin of speech and language. 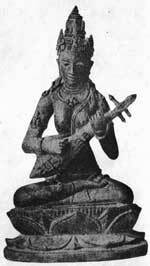 Sarasvati became attributed with the invention of Sanskrit, of its written script, and of Indian music. She is an inspirer, an inciter of song, of the intellect, of ideas. 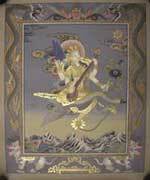 Sarasvati is depicted in a variety of ways, reflecting her history and her complex portfolio. She has many names. She sits or stands, sometimes dancing. 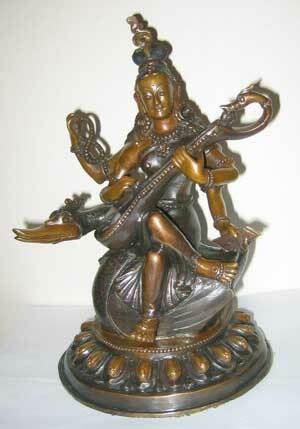 The above statuette from Nepal is typical, depicting her with four arms. In her two arms to the front she holds a vina ("veena"), an Indian instrument usually translated as a "lute". In her lower left hand she holds a book or manuscript, representing writing and literature. In her upper right hand is a rosary, representing time. As befitting an old river goddess, she is riding on a swan. This wicked-looking rather mythologized swan looks mightily pleased at having her on his back. He sits on a lotus, the ubiquitous symbol of beauty growing out of the slime. The Sarasvati wood carving on my bookshelf is from Bali and shows her with the vina and manuscript in her left arms, and the rosary in her lower right. 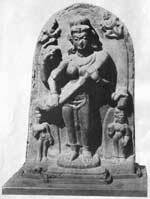 In her upper right hand is a lotus, another common item of hers; yet another being a water pitcher. Her vehicle is again a swan, but highly mythologized, again on the lotus. Her vehicle may be a peacock or other animal, even a lion. Sometimes she has only two arms, playing her vina. Sometimes she sits or stands on the lotus, the swan or peacock at her feet. I note that she has no arm devoted to deconstruction, nor to critiquing, nor to challenging preconceptions or pushing boundaries. All her arms are devoted to important things in human life.